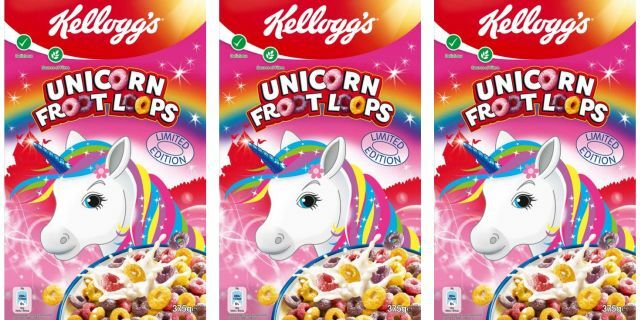 Kellogg's pushes the unicorn trend in the UK with the arrival of new Unicorn Froot Loops, which is mostly colorful special packaging but notable because Froot Loops have been discontinued over there since 2015. 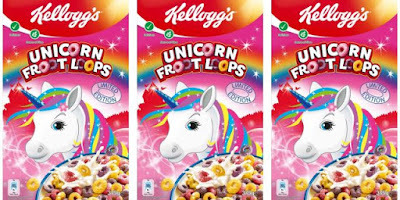 Perhaps appropriate to the unicorn theme, the new cereal is only available for a limited time and only at ASDA, a British supermarket chain. Beyond the box, the cereal is the almost same as when they were discontinued, which is still different from the Froot Loops we know here in the US. According to Wikipedia, the UK version is made with natural colors and flavors, which means the new cereal comes in a more subdued combination of yellow, pink, and purple rather than the brighter blue, green, red, orange, purple, and yellow of the American version (the previous UK version came in green, purple, and orange). They're also slightly bigger than American Froot Loops.